Fully programmable intervalometer for triggering multiple external devices with exclusive Hadland modifications for connectivity to high-speed & ultra high-speed cameras. Easily capture events too fast to see. StopShot is a programmable timing module for photographers who desire to capture water drops & splashes, ballistics, wildlife and other fast moving subjects without expensive high-speed cameras. Use the 4 button interface to easily program precise timing delays to trigger independent or sequential events such as firing flashes, releasing camera shutters* and time-lapse image captures. A variety of acoustic, IR beam, laser & vibration sensors can be used with adjustable gain sensitivity to experience the invisible. Three BNC connectors are included on the Hadland modified StopShot for interfacing high-speed & ultra high-speed cameras and testing equipment. The StopShot provides low voltage output from all triggering ports – an added benefit for electronic component protection of high-speed & ultra high-speed cameras. 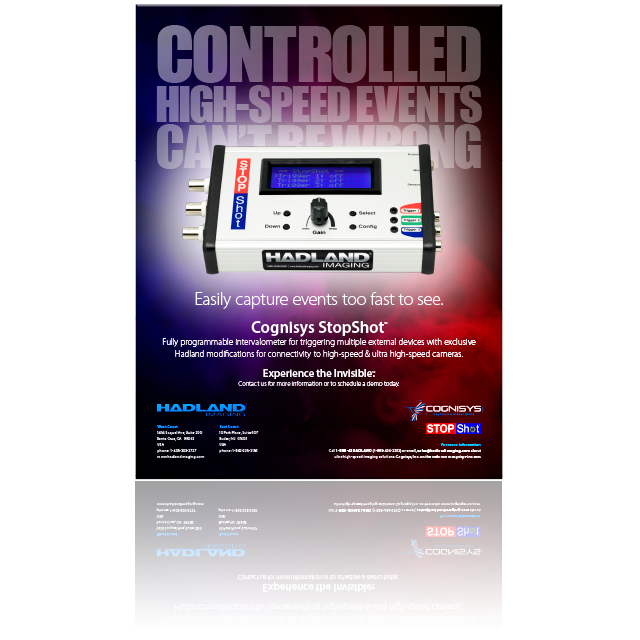 Contact us for more information about StopShot kits, sensors & more. We have the gear you need to get the job done right. 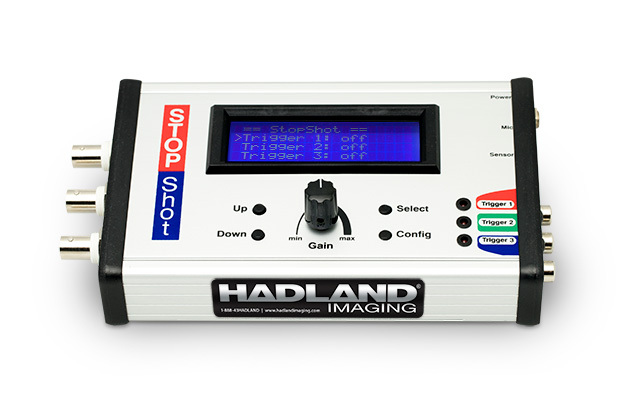 Press the button already or call 1-888-43HADLAND (1-888-434-2352) to get your Hadland modified StopShot (or at least find out more information). Don’t forget to ask about StopShot kits, acoustic, IR beam, laser & vibration sensors – we’ve got what you need & more. I want my Hadland modified StopShot!